From USA Today. In the picture, "Sacrifice" writer Sam Humphries uses a double-page spread of odd colors and imagery to depict what it's like to feel an epileptic seizure. According to Sam Humphries, there's absolutely nothing cool about having epilepsy. He's trying to change that with his time-travel fantasy, Sacrifice. Written by Humphries and drawn by Dalton Rose, the self-published comic-book series takes a modern-day man and Joy Division devotee with the same neurological disorder as Humphries and, by way of epileptic seizure, plunges him into the past more than 700 years to the era of something else that's personal to Humphries: the ancient Aztec civilization. "What people know about the Aztecs these days is either woefully inaccurate, if they know anything at all, or it's just disparaging," Humphries says. "There are a lot of old preconceptions about the Aztecs that go back to self-serving stories of the Spanish and the colonial Europeans that have survived for centuries. That's the only reason why in the past few decades have we done a broader cultural understanding of the Aztecs than we were. true story is extremely fascinating. So I really wanted to get that across in a popular format." Nearly a year after the release of the third issue, Sacrifice No. 4 arrives in comic shops and online Wednesday — the hiatus gave Humphries and Rose a chance to finish up the rest of the six-issue miniseries and also get all their other jobs in order. Known in the indie-comics world for his hit Our Love Is Real, Humphries had a huge 2012 in the mainstream, penning Ultimate Comic: Ultimates and John Carter: The Gods of Mars for Marvel Comics as well as Higher Earth for Boom! Studios. In Sacrifice, Humphries' main character, Hector, has a seizure in the parking lot of a San Diego fast-food restaurant and, courtesy of a visually surreal experience, is transported to 16th-century Mexico and discovers the Aztec world firsthand. Issue 4 continues Hector's journey as he is caught in the middle of an Aztec war, casts him in a new role as he gets used to his odd surroundings, and brings in the "butterfly effect" a smidge. Knowing of history and how the Spanish conquistadors conquered the Aztecs, Hector moves to keep that from happening, although certain Aztec figures figure out that he's operating with a different knowledge base from their own and understand the consequences of messing with the future. "The Aztecs were fascinated with time — a lot of their science is built on time, a lot of the religion and philosophy had to do with the nature of time, in a much more sophisticated way than the whole end of the Mayan calendar," Humphries says. "To an Aztec, the idea of changing history and playing with time in a way that'd be considered cavalier would be anathema to their culture and beliefs." Fans often ask him how much research he did on Aztec society and culture for Sacrifice, but it's actually his love and ongoing obsession for them that spawned the book in the first place. Humphries began his fascination randomly about 10 years ago, he says. His gateway in was the "gradually dawning notion" that the Aztecs were a complete and advanced people that flourished without having any contact with the civilizations of Europe and Asia that influenced our own global culture today. "When the Spaniards encountered the capital city of Tenochtitlan in Mexico, that city was the third largest city in the world," Humphries explains. "Probably none of those conquistadors had ever seen a city that size in their life. It'd be like if we went to the dark side of the moon today and discovered an alien city the size of Singapore. It'd be so completely foreign to us that we could only barely wrap our minds around their culture and customs and words and what that even meant for us and our civilization. "When the conquistadors encountered the Aztecs, it's the closest thing we've ever had to an alien encounter in human history. Science fiction taking place right here on Earth." In addition to collecting stacks of books on the Aztecs, Humphries has also studied their military and poetry and even took an Aztec cooking class. When the Spanish conquered the Aztecs, they discovered chocolate, taking it back to Europe and protecting the recipe "as if it were an oil reserve," Humphries says. "Other countries in Europe tried to discover this secret of chocolate, which I think could be a whole graphic novel on its own." As Sacrifice nears its endgame, Humphries teases that readers will see the infamous confrontation between the Spanish and the Aztecs, and maybe some tweaking of the time line, as well. "We're not just gonna see history as it unfolds in the rest of the book, but we're going to the very edge of history and going outside of it," the writer says. "We'll see the epic scope of one of the biggest moments in history, and we'll go beyond the knowledge of history and mankind and consider the events in Hector's life from that perspective." Bringing a good representation of Aztecs to comics was one goal for Humphries with Sacrifice, but another was writing a story where being epileptic is actually a plus. "Pretty much the only cool thing about having epilepsy is that in several disparate cultures around the world and in history, being an epileptic made you a holy person," Humphries says. "It made you someone with a connection to the spirit world or the afterworld, and it immediately made you a person of high regard and power in society. "When Hector goes back to the Aztec empire, they're about to kill him and they realize that he is a holy person as well, and that transforms it from a story where the main character gets killed off in the first issue to a story that has a much larger epic scope." The history of epilepsy has long been tied to religious experiences, but for Humphries, who had his first seizure when he was 8, it wasn't that much of a positive in his childhood, he says. "Especially when you're a kid, there's nothing cool about being an epileptic. Nobody wants to be the spaz at school." Also, he adds, "the kind of seizures I have and I experience come across as a really violent religious epiphany that you would never really want to have." However, Humphries admits that a seizure is a very strong out-of-body experience. "Being able to take that experience and turn it into something thrilling and visually beautiful but also terrifying at the same time was something I really wanted to do in the comic book." To depict it in Sacrifice, Humphries wrote Rose a really long description of what a seizure's like from his point of view that was so vivid "I'm sure it came across as the rantings of a crazy person," says the writer. Most people know what a seizure looks like from the outside — "Comical and horrifying, all at the same time" — but it's also terrifying and completely removed from most any other sensory experience he has ever had. The word "disorienting" doesn't even begin to cover it, Humphries admits. 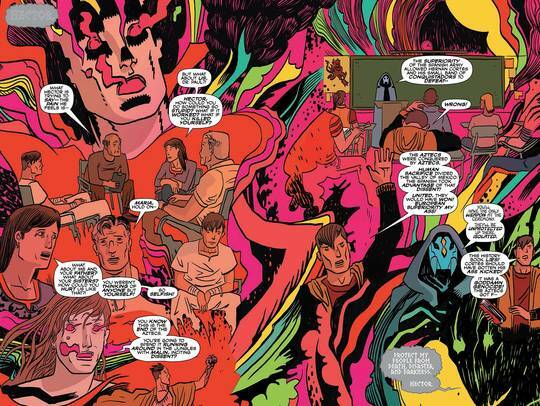 But he thinks what Rose brings back in the comic every time Hector has a seizure is a great encapsulation of the experience — a double-page phantasmagoria of lights, colors, weird imagery, memories and, in Hector's case, a shadowy figure. "There is so much of a subjective experience in having a seizure that can never be captured in a drawing or a two-dimensional page," Humphries says. "But Dalton comes really close to giving you an idea of what it feels like in that moment."